Smart phones and tablets have opened a whole new experience in dealing with all kinds of stuff. These band of devices covers an appealing platform to most of our daily activities. It ranges from entertainment to business and even in the scale of education. iPads bring a desktop-class medium for education with the sole advantage of mobility. There have been a slew of educational apps in the App Store that keeps kids and kids-at-heart hooked to their devices anytime they needed it. And Geo World Deluxe steals an ample amount of lightning among its peers. Geo World Deluxe, developed by Natalia Gavrylova, is a fun new way to learn Geography at the touch of your fingertips. The app negates the boring part of learning new places all over the world. The app also features US states, flags and capitals. This app is a delight for all trivia lovers with its seven different game settings that everyone could choose from. One of the best game presets is the Fall-n-Catch wherein you can opt to tap the right country that falls down on your interface. Of course, a Geography lesson won’t be complete if you can’t locate a specific kind of place in the map which you can find in the Locations game. You can also stack countries in Shapes to build a pile – the taller the pile the higher points you get. In the Neighbors game, you have to select the specific country that borders all the countries in your screens. Likewise, Capitals is a simple matching type game of the countries to its capital. Exploration is also interesting. This features a specific kind of country and everything about it like locations, flags, etc. Places uses Google Street View to give you a real-time game in matching the specific locations of a specific landmark. As expected of being an iOS-exclusive app (for now), the Geo World Deluxe is fluid. The app could process any kind touch that is thrown unto it without choking. Navigating through the interface is also a walk in the part. Likewise, the deep and light blues in the background are good to the eyes. Once you open the app, you will instantly feel that you are using an educational app with a “gaming” vibe. Maps and flags are all clear in different angles. To get a better grip to the information presented in the app, information is categorize in different titles: territory, flag, currency, landmarks and capital. The seven games are presented in a 360-degree rotating menu. Although the game logos are engaging, I still find it too complex in serving its purpose (logo doesn’t need to be overly drawn). You also get to choose your level of difficulty. Overall, the app has found its place in iPhone already – simple and easy to use. 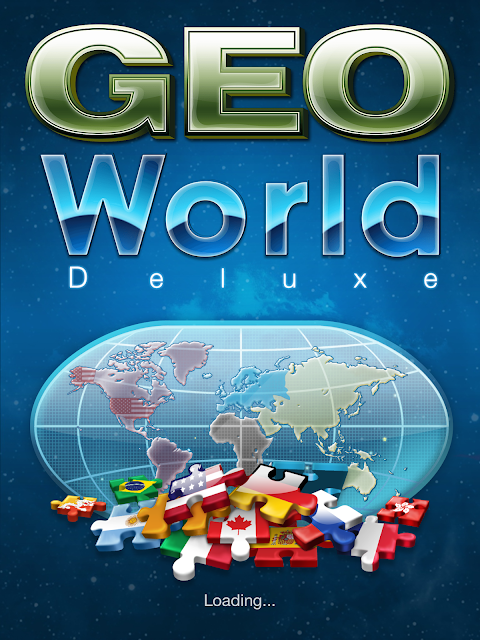 Geo World Deluxe 1.0 is an addictive educational app that has found it home in iOS. The app is not free but it is available in the App Store for only USD 0.99 in a limited time. Parents, if you’re in the market of finding an engaging app for you kids’ Geography fix, this app is one of the better selections. Kids will absolutely love it…and adults too.